Thanks to NETAVIS Software’s advanced data warehouse technology, HELLA Aglaia people sensors allow to supervise large-scale events such as the FIVB Beach Volleyball World Championship 2017 with 180.000 visitors in Vienna, Austria. Installed at specific points of interest, the 3D sensors counted visitors and kept track of the visitor streams to assure their security during the entire event. The collected information also improves the planning accuracy for future events. In 2017, the 11th Beach Volleyball World Championship of the International Volleyball Federation took place in Vienna. 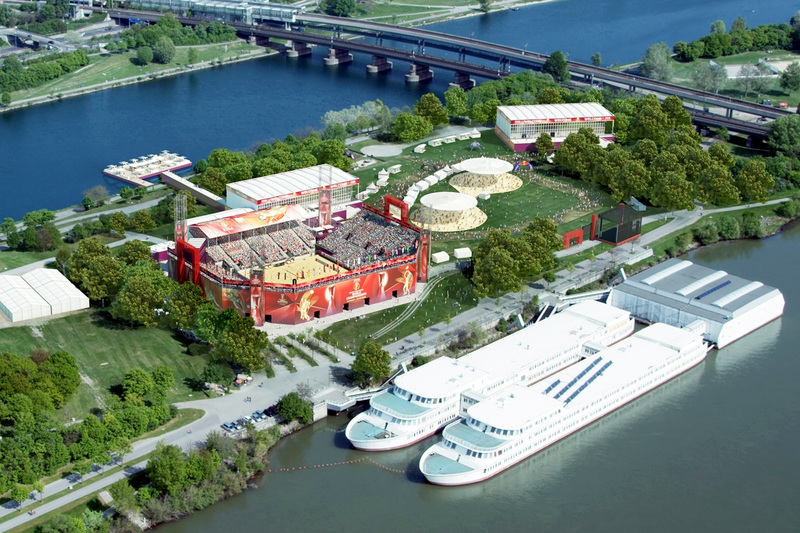 As the second most important tournament in this discipline, right after the Olympic Games, the athletic highlight drew in visitors from all over the world, transforming Vienna into the world capital of beach volleyball for the 10 days of competition. The venue of the tournament was a 16.000 m² area on the Vienna Danube Island, with a stadium for about 10.000 spectators at its center. In order to ensure the security during the event it was crucial to comply with pre-defined visitor limits for the Center Court as well as the overall area. Classical IP-based video surveillance combined with reliable video analytics should manage the streams of visitors and ensure that the visitor limits are not exceeded. Furthermore, the gained visitor frequency data should be documented for future events. NETAVIS Software fulfilled all these requirements with just one integral platform: the NETAVIS Platform for Security and Business. The powerful video management software NETAVIS Observer covered the classical video surveillance with 13 IP cameras. Thanks to its elaborate live monitoring capabilities, the security officers were easily able to follow the course of the event in the control center, and quickly react in case of any anomalies. At the same time, 13 3D sensors counted the visitors at the entries and exits of the Center Court and of the overall area, providing an accuracy of over 98%. NETAVIS sMart Data Warehouse offered a clear overview of the visitor frequencies in the Center Court as well as the event location in a specifically customized dashboard. By displaying the counting points directly on the location plan, the operators could easily keep track of the visitor streams. For the best overall picture, an intuitive diagram furthermore visualized the course of the day. The visitor streams were managed by an integrated NETAVIS application that sent an alarm to the control center whenever visitor limits were exceeded. The security staff was then able to decide according to the situation if an area had to be closed or not. By combining video management and video analytics, the security for the 180.000 visitors of this high-class event was optimally assured. The NETAVIS Platform for Security and Business not only facilitated the easy compliance with the legal visitor limits, the organizers furthermore had an intuitive overview of the visitor frequencies at the different areas of the competition site at all times. Moreover, the collected information is now available to facilitate the planning of further events. NETAVIS Software GmbH is a pioneer in server-based IP video surveillance and introduced video analytics as an integrative part of the open platform five years ago. In about 10.000 installations, project sizes range from 1 to 15.000 cameras. Customers from various branches including retail, government, banking, transport, industry and many more, have been trusting in NETAVIS Software for over 10 years. Based on this vast experience on the market, NETAVIS developed sMart Data Warehouse for user-specific visualization, contextualization and further processing of security and business relevant information. NETAVIS delivers its products and services through solution partners and distributors. More information is available at www.netavis.net.